I am a highly motivated and professional Project Manager, acting as director for my own Public Limited Company. I am renowned for my ‘can do’ attitude. An example of this was shown during the completion of a project at the Weald Grammar School, Tonbridge, where classroom developments had slowed due to planning restrictions. My ‘out of the box thinking’ and solution-orientated approach to ventures such as this resulted in the completion of this £3.5m works on time, to budget, at a high level of finish. My rounded experience within construction industry gives me a ‘bigger- picture’ viewpoint. This is used most successfully to ensure that all players are utilised to their strengths and that any potential issues are resolved before they arise. I have the ability to interpret and analyse situations clearly to formulate most appropriate response strategy. My positive outlook is reflected in my personal conduct. I have experience of both Retail developments on both the Contractor and Client sides managing many projects at any one time in many different locations within the UK. 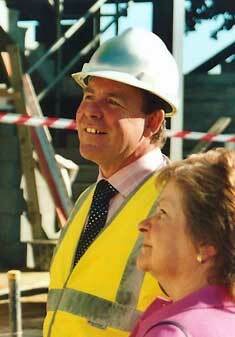 I was instrumental in managing various joint development schemes with a variety of developers, and contractors to make joint schemes workable for both parties. I have a wide range of experience within the construction industry, with a history that spans over 20 years in the construction sector of Project Management. My greatest aims within construction projects are to deal appropriate attention to Health and Safety during both construction and its conclusion, along with the Sustainable development requirements of individual projects. One example would be the 2010 development of St Margaret Clitherow Primary School where I encouraged the use of photovoltaics within the existing client design brief. My skills in planning techniques for a range of outcomes lead me to identify the many external influences that require consideration, for example, school projects require strict ‘Health and Safety’ and risk assessments before they can begin. Visit the sectors page to find out more. My experience spans roles as both client and contractor. This has allowed me to develop a balanced and fair viewpoint. I used this to great effect during my role as a professional consultant at the London Borough of Harrow offices. Using my clear communication skills, I reviewed the procurement and operating procedures within educational development and advised senior leadership as to the most effective outcomes, following my enquiries. My experience extends beyond consultancy positions, in a range of professional settings. I am equally comfortable and effective as a manager and team-worker from on-site scenarios to board meetings. Having been involved in a number of public and private sector developments, I can adapt my professional nature to any required situation. Visit the skills page to find out more about construction project management. As a manager, I have successfully overseen many high-value developments (up to £235m during the Jubilee Line extension project, 1991 to 1997) but I too recognise the value and importance of the smaller scale works that I have led. My competitive nature is evidenced in my project completions. Severe setbacks through water-damage resulted in a comparatively small five- week delay, whilst Cranbrook school projects completed 16 weeks and 10 weeks ahead of schedule respectively. Visit the projects page to view more of the construction works I have been involved with project managing. I have experience in clear and transparent budget overviews for all projects, working with project balance sheets and expenditures to ensure projects run to forecasted cost. I have also analysed and responded to public-sector excessive expenditure in my consultancy role at London Borough of Harrow. I have a detailed knowledge, through experience, of how to work with a range of housing and residential sectors, from large brand new urban developments such as the City Inns project in Westminster, to individual and privately owned listed properties, for example the Grade 1 listed Tudor property at Benenden School. I am strong and dedicated team leader, most recently managing a team of 30 individuals at Kew Gardens. Coupled with my professional judgement, I have positively critiqued all projects I have involved with, striving to ensure that the best possible result is achieved. I am happy to voice concerns and commend successes equally, striving to create a constructive team environment. I have successfully operated as a committee member, during my time as a voluntary member of Governing Body at Hillview School for Girls. I was responsible for decision-making procedures and cooperating with a number of interested parties regarding a diverse number of issues involving the daily operations and future development of this ‘Outstanding’ girls’ secondary modern school. I am committed in attending all meetings; I recognise the importance of clear communication between any involved parties. I also have a willingness to learn from fellow professionals for Continued Professional Development purposes. I am an approachable team leader, relaxed in nature. I will consider any ideas put forward by my colleagues, and happily discuss ways in which differing viewpoints can be compromised to reach the most-appropriate and satisfying outcome. Contact Bob Phillips today to find out how he can help you.